A trim card is used to show approved trims by attaching all garment trims and accessories on the trim card. In the production floor, supervisors used to follow the trim card as a guide for identifying the right trims. The trim card is made of white paper which is little thicker than the normal A4 printing paper. The company name, company logo, and company address are printed on the top. The size of the trim card normally kept higher than A4 size paper. Sometimes A4 size is also used for trim cards. 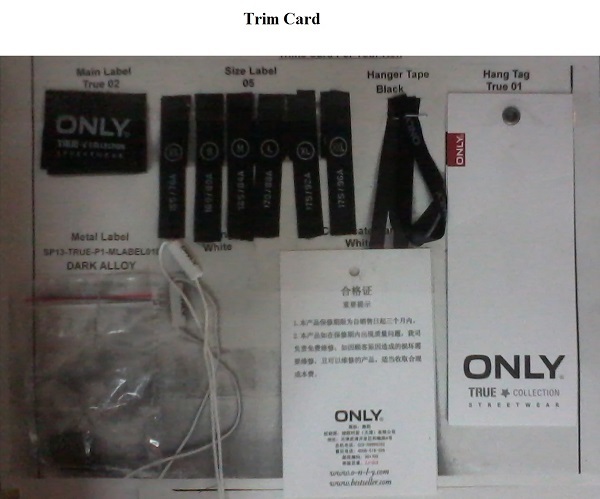 The trim card and the swatch card are referred to the same card. When a fabric swatch is attached to the card it is also called as swatch card. When trims are attached the same card is called as the trim card. Swatch card and the trim card is sent to buyers as well as to suppliers with the fabric swatch or other items or trim card can be used for internal use. In a garment export house merchandisers are supposed to make the trim card for the order they are handing over to the production team. They can get it done by store room assistants or by their assistants. You often need to send lab-dips, fabric swatch, different types of trims, print strike off, knit down to buyer for approval. all these are items are send to buyer attaching on a Trim Card. 1. The trim card is one of the very important components of the production file. Garment production team needs the guideline for making the garments and reference of right thread size, label, and other trims to be added to the garment with correct specification. In the trim card, they get approved items. The approved trim card is also displayed on the production board in the stitching line. 2. Store room follows the approved trim card to verify trims and fabrics quality that they issue against an order. 3. Quality inspectors need the approved trim card at the time of garment checking and shipment inspection. Merchandiser prepares one copy of the trim card for quality inspector's file. Quality controllers need to follow reference of approved item whether it is a fabric shade, button color and button size, care label text. 4. Trim approval from buyers. As a standard procedure, approval of all trims and accessory items are taken from the buyer prior to use in bulk production. To submit the sample of the bulk trims and bulk fabric swatches to buyers, and buying house trim card is use. A merchandiser uses the trim card to send the reference fabric or trim for the sample development to the suppliers. Let's assume you are preparing trim card for internal use. Follow the below step to make the trim card. Make a list of trims to be attached to the garments. Like stitching threads, button, zippers, twill tapes, laces, labels etc. Take approval of all these trims from buyers or the concerned person. Take 2-3 trims for all items from store depending on the number of copies you want to make. Take one trim card and write style name and order number on the top of the card. Attach trims on the card by staple pins or affix the item by adhesive tape. In case, you can't place all trims on a single card, you can use an additional card for making your trim card. Write the name of each item with the article number (item code number). You can also mention garment location where to attach that particular trim. Cross check the trim with the approved one and sign on the trim. You can cross sign on all items. Make sure signed items can not be replaced easily. Your trim card is ready. Use the trim card as required. Trim card, use of the trim card in garment production, trims approval. Learn how to prepare the trim card.